The Global Volcanism Program has no activity reports for Yufu-Tsurumi. The Global Volcanism Program has no Weekly Reports available for Yufu-Tsurumi. The Global Volcanism Program has no Bulletin Reports available for Yufu-Tsurumi. A group of lava domes rises above the noted hot spring resort city of Beppu on Japan's Inland Sea, possibly within an ancient breached caldera. Two large lava domes, Tsurumidake and Yufudake (the highest at 1,584 m), are located at the east and west sides of the complex, respectively. Three smaller lava domes are on the N flank of Tsurumidake, including Garandake. The latest activity at both the andesitic-to-dacitic Tsurumi and Yufu groups postdates the 6300-year-old Akahoya ash from Kikai volcano. Pyroclastic flows dominated during older eruptions, whereas lava domes and lava flows are most common in more recent eruptions. An eruption about 2200 years ago from Yufudake began with collapse of the N flank that produced a debris avalanche and was followed by lava dome growth and associated pyroclastic flows. Only a single eruption, from Tsurumi in 867 CE, is known in historical time. The colorful hot spring pools and mudpots of Beppu along the coast form one of Japan's most noted thermal areas. Fujisawa Y, Ueno H, Kobayashi T, 2001. 2.2 ka eruption study on the emplacement temperature of pyroclastic deposits of Yufu volcano, Japan. Bull Volc Soc Japan (Kazan), 46: 187-203 (in Japanese with English abs). Honma F, 1926. Beppu, the Hot-Spring City. Pan-Pacific Sci Cong Guidebook Excur, E-1.5: 1-16. Japan Meteorological Agency, 1975. National Catalogue of the Active Volcanoes in Japan. Tokyo: Japan Meteorological Agency, 119 p (in Japanese). Japan Meteorological Agency, 2013. National Catalogue of the Active Volcanoes in Japan (fourth edition, English version). Japan Meteorological Agency. Japan Meteorological Agency, 1996. National Catalogue of the Active Volcanoes in Japan (second edition). Tokyo: Japan Meteorological Agency, 502 p (in Japanese). Kuno H, 1962. Japan, Taiwan and Marianas. Catalog of Active Volcanoes of the World and Solfatara Fields, Rome: IAVCEI, 11: 1-332. Ohta T, Hasenaka T, Fujimaki H, 1990. Geology and petrography of Yufu-Tsurumi volcano group, Oita Prefecture. J Min Petr Econ Geol, 85: 113-129 (in Japanese with English abs). Saito T, Kamata H, Ishikawa N, 2000. Lithofacies and thermoremanent magnetism of the Ikeshiro pyroclastic-flow deposit and the Ikeshiro-Hokubu volcaniclastic deposit in the Yufu-Tsurumi volcano group. Bull Volc Soc Japan (Kazan), 45: 217-224 (in Japanese with English abs). Yamasaki T, Hayashi M, 1976. Geologic background of Otake and other geothermal areas in north-central Kyushu, southwestern Japan. In: Proc 2nd United Nations Symp Devel Use Geotherm Resour, San Francisco, Washington D C: U S Government Printing Office, 1: 673-684. There is no Deformation History data available for Yufu-Tsurumi. There is no Emissions History data available for Yufu-Tsurumi. 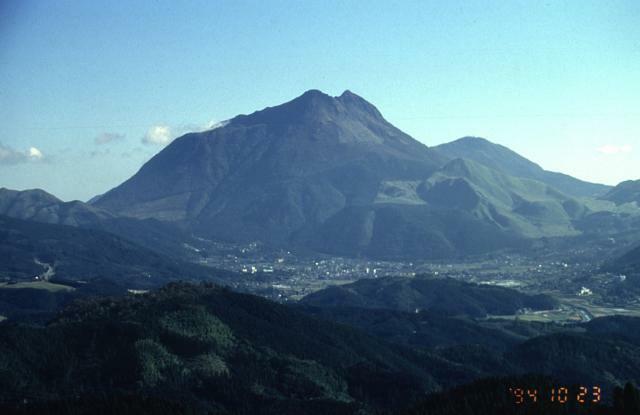 Yufu-dake, the westernmost of the two large lava dome complexes of Tsurumi volcano, rises to the NE of the city of Yufu in northern Kyushu. Three smaller lava domes are located on the north flank of the eastern dome, Tsurumi. Only a single eruption from Tsurumi volcano, in 867 CE, is known in historical time. The colorful hot spring pools and mudpots of Beppu, one of Japan's most noted thermal areas, are a major tourist attraction at the coastal city of Beppu, east of the volcano. Photo by Yukio Hayakawa, 1994 (Gunma University). There are no samples for Yufu-Tsurumi in the Smithsonian's NMNH Department of Mineral Sciences Rock and Ore collection. Large Eruptions of Yufu-Tsurumi Information about large Quaternary eruptions (VEI >= 4) is cataloged in the Large Magnitude Explosive Volcanic Eruptions (LaMEVE) database of the Volcano Global Risk Identification and Analysis Project (VOGRIPA).